It seems the rest of the world has nothing on some California sunshine! 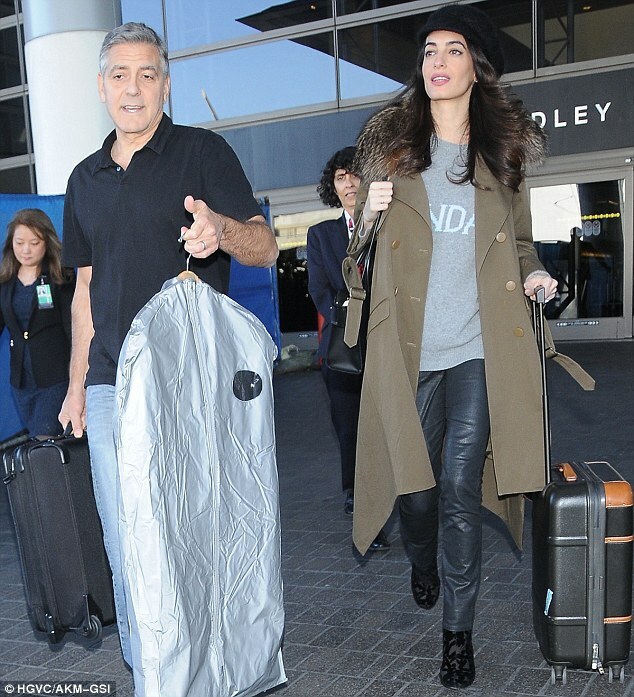 George and Amal Clooney touched down in Los Angeles on Friday after recent trips to Switzerland and England. The duo looked stylish together as the 38-year-old human rights lawyer wore a gray sweater with a heavy coat, while the 55-year-old Oscar winner looked casual in jeans and a collared shirt. The couple kept pretty busy schedules while overseas. Last week, they attended the Women of Impact Dinner hosted by publisher Tina Brown in Davos, Switzerland, where Amal was one of the honored guests. Earlier this month, they both stepped out in London for the screening of the Netflix documentary, The White Helmets, at a reception hosted by The Clooney Foundation for Justice. George and Amal were spotted in early January taking a romantic stroll near their mansion in Sonning, England, along the riverbank. The couple has been in the process of renovating the historic mansion they bought shortly after their September 2014 wedding. Maybe, the funeral is tomorrow. annemarie wrote: Maybe, the funeral is tomorrow. Maybe that's why George looks so intense. Saying goodbye to someone you love is never easy. I'm going to keep them in my thoughts and prayers. Is Miguel's funeral definitely tomorrow? That was my first thought for why they were back , George may have something to take care of in Los Angeles. When I googled there is a video supposedly of the funeral , I won't click that is too much for me. WWHS, so many of your posts just baffle me. This one is no exception. Another edition of "JMHO"..... they aren't making any announcement- yet ( maybe People gets the exclusive ala engagement - ??? sonogram photos), they aren't trying to squelch the rumor from the look of her sudden interest in non-fitting clothes, soooooooooooooooo. annemarie wrote: That was my first thought for why they were back , George may have something to take care of in Los Angeles. I googled funeral, and got a you tube . It's a really really blurry still photo of someone in a casket. Could be anyone, but doubt if it's Miguel. No doubt the viewing is private, and NO ONE in the family/close friends would do sure a horrid thing as to post a photo like this. PigPen wrote: Another edition of "JMHO"..... they aren't making any announcement- yet ( maybe People gets the exclusive ala engagement - ??? sonogram photos), they aren't trying to squelch the rumor from the look of her sudden interest in non-fitting clothes, soooooooooooooooo. Good point. However, I do have a critique of your comment " can't say fatter to Amal",,,cause you can't be more of something that you never were in the first place!! Don't think they need to tell anyone. Whether Amal is pregnant or not they are handling it the way they want to. They are not obliged to inform anyone at this time. Amal would not be far along if she is pregnant and generally many women don't like their pregnancy news to become public knowledge too soon. Some say it's bad luck. Regardless we the public will know one way or another eventually. It is no one's business but theirs if she is we will know if not we will know. I think to announce it would be crazy if the press are this nuts now over a rumor with no facts , it will be absolutely mad if they announce it. They should be allowed to enjoy their secret for as long as possible if there is one. They did remain silent on rumors about their relationship, engagement, and even the date and location of the wedding until they became self-evident with PEOPLE exclusive each time. George only lied once about their first public date-yet did not utterly deny she was seeing him in a Gravity premiere. Amal deleting her Twitter and Instagram must be George's suggestion, after bashing social media himself in a interview. Smart, savvy George Clooney gossip patterns. Sevens wrote: They did remain silent on rumors about their relationship, engagement, and even the date and location of the wedding until they became self-evident with PEOPLE exclusive each time. George only lied once about their first public date-yet did not utterly deny she was seeing him in a Gravity premiere. Amal deleting her Twitter and Instagram must be George's suggestio, after bashing social media himself in a interview. Funny sound just like engagement when happen. George Clooney and wife Amal touched down in LA on Friday for a dose of California sunshine. The 38-year-old human rights lawyer was covered up in a baggy sweater with a heavy coat layered on top while the actor, 55, kept it casual in jeans and a collared shirt. Amal sparked baby rumors a few weeks back after she was pictured wearing a floaty dress at The White Helmets screening, with Piers Morgan among those who speculated that she might be pregnant. Tho couple have yet to comment on the rumors. The pair are back in the US following overseas travels. Last week, George and Amal attended the Women Of Impact Dinner hosted by Tina Brown in Davos, Switzerland. Earlier this month, the duo stepped out in London for The White Helmets screening at the Bvlgari Hotel. Guests included actor Douglas Booth, and the film's producer Joanna Natasegara and director Orlando von Einsiedel. So it's fine copy and paste pic too? Didn't we better use the specific programs? Not any more! The forum updated itself about three years ago. When you paste, make sure the 'switch editor mode' button (the one on the bottom right that looks like a piece of paper) is off, and then you can paste pictures and text directly from another article. The formatting is a bit messy, I agree, but it's still better than just links. But that's the whole point, Katiedot... if we did things to make your life easier- you wouldn't be around as much!! what the heck are you talking about WWHST?????????????????????? Lol, George wearing bronzer. Well summer will be here before we know it and his summer tan will be back . Cindy and RandE are in Cabo at what looks like the veranda where they've all been papped before! PigPen wrote: But that's the whole point, Katiedot... if we did things to make your life easier- you wouldn't be around as much!! But seriously, it was the opposite, actually. Constantly cleaning up and editing everyone's messages just got too much. That's why I was gone for such a long time. Just couldn't face doing it all the time. That's one of the reasons I stopped too. There are some posters who NEVER copy and paste their articles, then the articles disappear before anyone else can see them or read them. One of my pet peeves. In their/my defense... there have been times when I've tried to copy and paste, and the darn thing just won't stick. Hate to admit it, but this is one luddite who just doesn't know how! I've tried and never did it right. Mea culpa! Almost all sites allow copying nowadays. Just use your mouse to select the whole article, come to here and paste. Miss Katiedot... pleeeeeeeeeeeease stay on topic! !